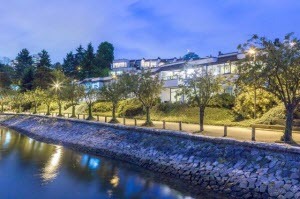 STUNNING WATERFRONT False Creek retreat in heart of Vancouver! From dawn to dusk, ever-changing lights and colours of the city and water present their own dramatic 50 shades of ecstasy. Nothing compares to this breathtaking one level, 2 bedroom and den, seaside townhome.